Malaysia is expected to fulfil its targeted GDP growth rate of 5.1% projected under the 11th Malaysian Plan (2016 - 2020). Digital Transformation and adoption of Internet of Things (IoT) will be key to unlocking future potential growth. 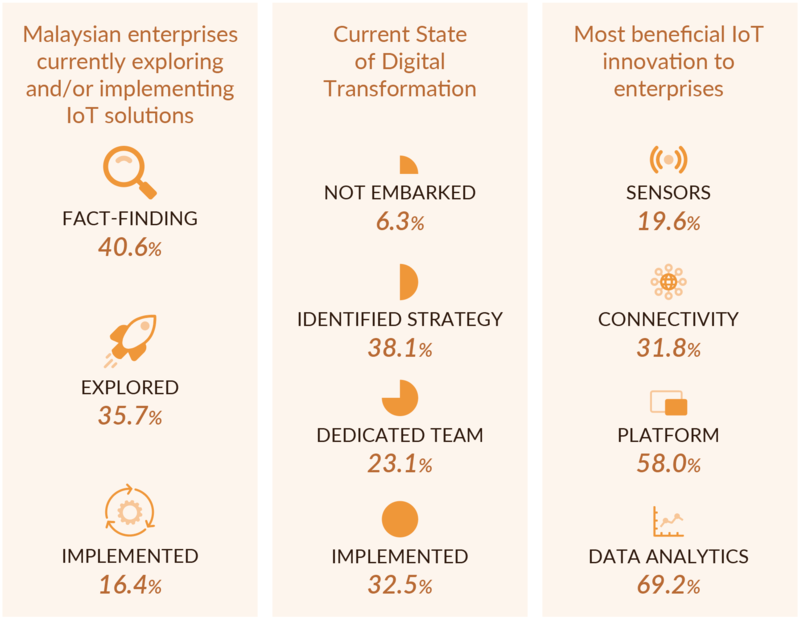 According to Asia IoT Business Platform 2018/2019 Enterprise IoT Report, 9 out of 10 enterprises in Malaysia have identified their digital strategies over the next few years, but 40% are still at exploratory stage. From the rollout of National Fiberisation and Connectivity Plan (NFCP), establishment of Digital Free Trade Zone, to the recent Industry4WRD policy, Malaysian government agencies and enterprises are embracing digitalization to tackle issues across sectors. Advised by a panel of industry experts across the digitalization ecosystems in Malaysia, we have highlighted 5 key potential for technology adoption to address at the 6th annual edition of Asia IoT Business Platform in Malaysia on April 23 & 24. Road congestion continues to be a problem for Malaysia: 93% of Malaysian households own at least one car – this, coupled with our dense population, makes for heavily congested roads and bad traffic conditions. With smart mobility being one of the key aspects of its Smart Cities Initiatives, Malaysia launched the Intelligent Transport System Blueprint 2017-2022 to upgrade its current transportation system, with big data analytics forming the core of the system. Some of the notable projects launched include the Malaysia City Brain to optimise traffic and parking and better facilitate energy management in Kuala Lumpur, and the Smart Bus Stop pilot to boost public transport users in Penang. Tenaga Nasional Berhad, the largest power utility company Malaysia, recently secured $4.54 billion funding to upgrade its transmission grids and supply infrastructure. Key investments include smart grid technologies to promptly meet changing electrical demands, advanced metering infrastructure and grid automation, and deployment of 1.54 million smart meters throughout the Melaka and the Klang Valley region. Water utility company, Syarikat Bekalan Air Selangor (SYABAS), has also hopped onto the digitalization wave with the deployment of ‘Integrated SYABAS Water Management Information System (SWIMS)’ to enable their data centre to quickly resolve major computer catastrophes involving loss of information and operations down-time, and a VPN network to connect to all of SYABAS’ district offices with the HQ. To ensure efficient supply of energy and enhance consumer experience and security, Malaysia plans to incorporate blockchain technology in its 3 largest industries: Renewable energy, the palm oil industry and Islamic finance, spearheaded by the Malaysian Industry-Government Group for High Technology (MiGHT). In future, Malaysia expects to venture into Artificial Intelligence (AI) and Advanced Analytics (AA) to complete its digital transformation in utilities. Manufacturing has been a critical growth driver of the Malaysian economy, contributing about 23% to the country's GDP in the last five years. In October 2018, Industry4WRD, the national policy for IR4.0 was launched with the objective of transforming the manufacturing industry and its related services to be smart, systematic and resilient. Incidentally, two winners of the Asia IoT Business Platform Malaysia Enterprise Innovation Awards - Fraser and Neave (F&N) and FGV Holdings - were from the said industry. At our ASEAN gathering last month, both companies highlighted that Industry 4.0 solutions key for Malaysia's growth. Technology adoption by forward-looking enterprises will provide reference and inspiration for local SMEs to adapt practical solutions to improve their businesses. F&N, a 136-year-old conglomerate, is in the process of implementing digital platforms and mobility solutions to provide transparency and ease data collection for further analysis. F&N aims to incorporate more functions into its mobile workforce solutions such as AI and machine learning. En. Wan Norman Nasir, Chief Risk Officer of FGV Holdings Berhad at AIBP Singapore 2019, Feb 14. FGV Holdings' case study was on Enterprise Risk Management System (ERMS) to better manage risks on their plantations and properties. The Chief Risk Officer of FGV spoke at length about the implementation of the system in 2008 and how the system has constantly evolved. In 2018, the system overhauled its metrics and framework of risk assessment to be more efficient and effective. FGV aims to standardise its risk assessment process across its subsidiaries using a hierarchy structure to ensure consistency. The new system also features correlation analytics between several assessed factors and mapping functions to better illustrate analysis. Outpacing brick and mortar growth by 10 times, Southeast Asia countries expect to see retail e-commerce sales grow by more than 15% per year during the period 2016–2021, with Malaysia leading the pack at nearly 24% per year. Connectivity is an important factor to strengthen the e-commerce industry and various initiatives have been initiated such as the Digital Free Trade Zone to ease access to cross-border infrastructure, remove complex trade regulations and processes, and foster knowledge-sharing; the Port Klang Net as a platform to enable stakeholders across the logistics value chain to communicate in real-time; the 24/7 Pos Laju Prepaid Dropbox service to allow customers drop off their prepaid parcels at self-service automated machines. Azli Mohamed, Chief Strategy Officer of Malaysia Airports at AIBP Malaysia 2018, April 24. As part of Malaysia Airport's 4.0 initiatives, 3D sensors, biometric IDs, predictive solutions for baggage handling systems, blockchain, etc, are being explored. Given its strategic location, good regional linkages and strong transport infrastructure, Malaysia has the right endowments to position itself as a regional logistics gateway. Technology plays an important role in this sector to keep up with the e-Commerce growth. With changing consumer behavior and increasing competition from pure play eCommerce platforms and e-tailers, we are seeing traditional retailers in Malaysia incorporating online services into their business models and tailor their strategies in accordance to shifts, making online to offline integration a key tenet of retailers strategies. One key example: AEON Co. Bhd, one of Malaysia largest chain supermarkets, formed a business alliance with Honestbee, an online concierge and delivery service, to develop new services as part of an effort to digitalise the customer’s shopping experience. For brick-and mortar stores to retain shoppers, location-based services, interactive mirrors, virtual reality (VR) and augmented reality (AR) are being sought to increase shoppers’ convenience, gamify the retail environment, drive customer engagement and enhance customer satisfaction. Sunway group is one of the retailers starting to adopt digital technologies mentioned above. In late 2018, a shopper tracking systems, that identifies a unique ID of each mobile phone carried by shoppers was being incorporated into their malls. Sensors were installed throughout Sunway Velocity mall to monitor footfall and shopping patterns, and subsequently use data analytics to engage and attract new customers via mobile applications. At an event last week, Communications and Multimedia Minister Gobind Singh Deo said that Malaysians were already one of the most digitally connected societies in the world, and roughly 80 percent of the people have access to the internet, mainly through mobile networks. “However, we are fully aware of the fact that there is a digital divide where we are lagging behind the international standard in terms of digital adoption by businesses." The 29th edition of Asia IoT Business Platform in KL this April 23 & 24 will bring together government agencies and local enterprises to discuss digitalization initiatives across segments, and explore how solution partners can help to address some of the challenges faced. Download brochure here. Drop me a note if you’re interested to discuss more about specific projects mentioned above.